This essay dialogue aims to give readers a healthy selection of great books for their summer reading lists. We invited contributors to choose their favorite social movements/protest-related book of the past couple years, whether scholarly, activist, or fiction, and write a short review. Although mainstream academic social movements texts were welcome, we encouraged contributors to consider books that most readers might not know about, such as non-scholarly books that don’t get reviewed in academic journals. We include scholars from a wide range of disciplines as well as a variety of activists in an effort to give our readers a broad list of selections. Worthen, Molly. 2014. Apostles of Reason: The Crisis of Authority in American Evangelicalism. Oxford University Press. The role of ideas for collective action has long been regarded as central to the study of social movements. However, the focus fluctuates between implicit and explicit discussions. This vacillation is complicated by the fact that, at times, ideology has been perceived as a derogatory component only advanced by religious, social, or political extremists (Oliver and Johnston 2000; Kniss and Burns 2004). Too often, when scholars attempt to distinguish the role ideology plays in movement mobilization and potentially factionalism, it gets reduced to artificially simple and coherent sets of ideas that necessarily unite members. Yet, ideologies center on cognitive, emotional, and morally charged experiences for individuals and groups as they are localized and constructed in response to varied knowledge and conditions; it’s the very stuff that we have stakes in for understanding any social movement (Williams and Platt 2002). In light of this, then, ideological production and negotiation are vital to examine, as they point to how movements choose among alternative courses of action. 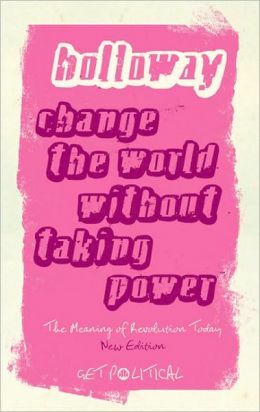 Eleven years after its first publication (in 2002), John Holloway’s Change the World Without Taking Power remains one of the most contested and controversial books of contemporary Marxist theory, having been translated into ten languages and seen three English editions in 2002, 2005 and 2010 (Holloway 2010: ix-x). In response to a series of critiques to the first edition of his book, namely on how can we advance the struggle for society’s self-determination—or Communism—without taking state power, the 2005 edition presents a new epilogue. Upon continuing controversies, the 2010 edition includes an “extensive” preface, in which Holloway felt it necessary to reassert the timeliness of the book after the waning of the Zapatista movement and Argentine piquetero and neighborhood assembly movements. In his preface, he rather points to the so-called “state-centered developments” (Holloway 2010: xi) in Venezuela and Bolivia, and keeps asking: “how do we stop making capitalism?” (Holloway 2010: xii). He claims that he does not know the answer to this question, while, on the other hand, quite firmly asserting that “the state has no part” in the solution (Holloway 2010: xii). A Theory of Fields, by Neil Fligstein and Doug McAdam. Oxford University Press, 2012. A Theory of Fields is the product of the longstanding collaboration that began during the 1980s, when Neil Fligstein and Doug McAdam were colleagues at the University of Arizona. They define a strategic action field as a “constructed mesolevel social order in which actors (who can be individual or collective) are attuned to and interact with one another on the basis of shared (which is not to say consensual) understandings about the purposes of the field, relationships to others in the field (including who has power and why), and the rules governing legitimate action in the field” (p. 9). They distinguish fields from the concept of “institutional logics,” which they see as implying too much consensus among actors and focusing too much on reproduction (p. 11-12). Reading Classes: On Culture and Classism in America, by Barbara Jensen. Cornell Press, 2012. And unlike most things I’ve read about kids disengaged from school, which focus on their deficits and fret about their life chances, Jensen, a counseling psychologist who has long worked with such kids, celebrates the working-class cultural strengths that motivate some of them, even as she is realistic about their struggles. Reading this wise and evocative book through my own lens of wanting to organize progressive social movements, I saw that the working-class cultural traits she describes are some of the essentials of movement-building. Summer is here, and when you head to the beach (or, more likely, your library carrel), Mobilizing Ideas wants you to be reading the latest and greatest notable books on social movements and social change. This month, we asked several scholars and activists: what is your favorite movements-related book, fiction or nonfiction, published in the past few years? While academic social movement texts were welcome, we encouraged contributors to select books that might not be reviewed in mainstream academic journals. As usual, we are releasing several posts now and will publish a few more on this topic later in the month. We received some great responses, which we hope will help you select some good titles for both entertainment and education as you get your much needed summer rest. Karen Gargamelli, Common Law, Inc.